Looking for a spin bike for home? We have put together this guide to help you find a spin bike that won’t turn out to be a waste of money. We have found bikes for a wide range of budgets, so take a look at the models below. Top of the list is the JLL IC300, with an 18Kg flywheel JLL have designed this bike for beginners and serious athletes. It is easy to adjust the resistance using the knob underneath the display perfectly within arm’s reach even as you are cycling, which is perfect for those HIIT workouts. This bike also features in our exercise bike reviews guide. The display shows all the important metrics such as: speed, time, distance, calories, odometer and pulse. I am glad JLL included the heart rate monitor as I think that they are particularly useful on spinning bikes as it allows you to perform a heart rate workout to ensure you are burning as many calories as possible. The IC300 uses a 3-piece crank system which helps to make it feel as though you are riding a real bike while also making the bike more durable. When I first used this model, I struggled to get comfortable but after some adjustments I felt as though I could go for hours without becoming sore. The 12-month home use warranty is a massive bonus as it helps to give you peace of mind when deciding whether to buy a piece of equipment or not. This bike is very similar to the XS sport in many ways offering great quality at an affordable price. If you go with either of these models you are sure to have many great workouts ahead of you. However, we have decided that the JLL IC300 just sneaks in front thanks to the 12-month home use warranty. For our next bike we have the XS Sports Aerobic. We have been privileged enough to try a number of XS sports products and it is easy to see why they are highly regarded in the fitness equipment market. 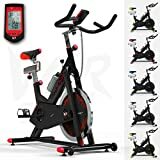 You get a great quality spinning bike at a very affordable price. This model comes with all the features that you need to have a great workout while ignoring the unnecessary extras that only inflate the price. You get a 15Kg flywheel which offers plenty of resistance to give you a challenging smooth workout. With all these spin bikes, as you turn the adjustable resistance knob you will feel a huge difference as it applies the brake. A gym spec spin bike would have a 22Kg flywheel but this isn’t entirely necessary and I would happily save a few hundred pounds and drop a few kilograms on the flywheel. A feature that you don’t often see on the cheaper models of spin bikes are the pulse sensors. So, I was pleasantly surprised to see the pulse sensors fitted on the handlebars especially considering that this bike can be bought for about £150. The display is quite basic but if that means it keeps the price down then I think it is a worthwhile sacrifice as it still tracks all the important metrics such as: speed, time, distance, pulse and calories. You simply press the button and you cycle through the different functions. The elbow rests bring an extra level of comfort to the bike. Quite often spinning bikes aren’t very comfortable as they tend to have a hard-narrow seat but I had no such problems. This model offers great value for money and it was a very close call between the IC300 and the XS sport. Next on the list is the We R Sports Aerobic Exercise Bike. This spinning bike has the lightest flywheel out of the three spinning bikes I have reviewed as the other two have a 22 kg flywheel, while the We R Sports bike has a 13 kg flywheel.Therefore it doesn’t feel quite as realistic as the heavier flywheels but what do you expect when you are paying a fraction of the price. 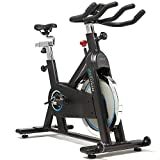 This bike has everything a beginner through to intermediate spinning rider would need and offers a fantastic intensity and allows you to improve your fitness. 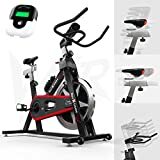 The We R Sports exercise bike is a basic spinning bike and that is why it doesn’t cost so much. So if you are looking to get in shape and don’t want to drain your bank account then this is the bike for you. Our next pick is the We R Sports RevXtreme. The first thing that you will probably notice about this bike is that it looks like a bit a beast. Well it doesn’t just look like one, it is a beast! The ride is smooth and the 22kg flywheel gives you plenty of resistance if you want to have an intense sweaty workout. The box is heavy and you will need some help to get the bike to where you want it but it is relatively simple to put together and doesn’t take very long at all. The seat isn’t the most comfortable one I have ever sat on but it is only a minor problem and nothing a gel seat cover can’t fix. You could always change the seat to one of your choosing as well as it is possible to remove the seat. Our list ends with the JTX Cyclo 6. The title of the bike says it all, “gym spec.” This bike wouldn’t look out of place in any spinning class in any commercial gym. Having a bike that can push you to your absolute limits is amazing as normally when you buy home gym equipment you accept that it isn’t the same standard as your gyms equipment and settle for a lower intensity as you have paid a lot less. At the end of the day you always get what you pay for and this bike does cost slightly more but it is well worth it if you really want to be able to give 110%. The friction pad on this model is made from leather which means that it should last a lot longer than the fabric versions that you tend to find on cheaper models. When you buy any product it doesn’t matter how amazing the product is if the service you get is terrible. The service of JTX fitness is some of the best and I have ever seen and I have only heard glowing reviews of the company. When they say you get a 2 year home repair warranty you feel safe as you know any issue will be sorted quickly. They also ensure that when the bike is delivered it isn’t just left outside your front door for you to struggle with, a two-man delivery team will put the box in the room that you wish it to be. I am normally pretty good at finding something wrong with any of the bikes I review, even just minor things. However I really can’t think of anything and it kind of frustrates me as I do like to moan. Read our full review of the JTX Cyclo 6. Why Buy a Spin Bike? In recent years spinning has exploded in popularity and it is almost impossible to go into any commercial gym and not hear the sound of music pumping with an instructor shouting encouragement at the riders as they melt onto the floor. There is a great sense of satisfaction of emerging out of a dimly lit studio feeling as though you have truly pushed yourself to the limit. The fantastic thing about going nowhere fast, is that there isn’t a huge amount of exercise equipment required, just you and the bike. Therefore this has led to a huge increase in spinning bikes being bought for home gym use. You can either pay your monthly gym membership fee which could be up to £50+ a month and attend their spinning classes or purchase your own home spinning bike and do a spinning workout whenever you want to. If you think you would miss the instructor screaming out you then there are plenty of free spinning class videos that you can play through your TV at full blast. We all know the benefits of cycling in general such as to stay fit and strong, however a spinning class trains you in a slightly different way to promote maximum fat burning and strength. For example the different positions that you ride the bike target your core muscles in a different way helping to tone that mid-section and defining those abs. 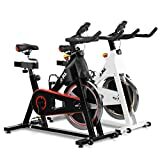 I hope that these reviews have helped you to decide what kind of indoor spinning bike you would like as there are a number of different features which can be a slightly confusing at times. The key one point I would emphasis is to make sure the ride is comfortable! This is very important even if you have to get a couple of extras whether that is spinning shoes or a gel seat cover. You can even replace the seat/ pedals on most models if you really want to make the bike fit you comfortably. It is important to set up your spinning bike correctly and there are a number of tutorial videos that will help you to be safe and comfortable while doing your workout. I would also recommend to stretch thoroughly after a workout, as often people hop off the bike once the warm down is done and go straight home again. It will help with your recovery reducing soreness the next day by getting oxygenated blood back into the muscles and helping to disperse any lactic acid that will have built up over the course of your workout.